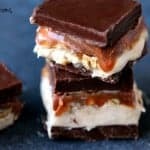 Homemade Snickers Cheesecake Bars uses cream cheese in the filling for a little added YUM to your favorite candy bar! Line a 11 x 17 inch baking dish with parchment paper. Set aside. Use a double boiler to melt the chocolate chips and peanut butter. Stir occasionally until smooth. Pour into the baking dish. Pop this in the freezer for about 5 to 10 minutes to harden. Combine the fluff, peanut butter and confectioners sugar in a mixing bowl, stir until combined. Pop the cream cheese in a stand mixer and whisk on medium speed until smooth and fluffy. Add the ingredients from the other bowl into the mixer and whisk until combined. Pour over the chocolate layer you placed in the freezer earlier. Press the peanuts into the mixture slightly. Pop back in the freezer for about 5 to 10 minutes. Use a double boiler to melt the caramels in the cream. Simmer over hot water until caramel is smooth. Allow to cool slightly. Now pour the cooled caramel over the filling mixture and peanuts. Pop back in the freezer for about 5 to 10 minutes. Cut into squares with a sharp knife. This recipe is a bit messy. Just roll with it. It's totally worth it. Serve with a big old Snickers loving smile! Recipe slightly adapted from Roxana's Home Baking and Imperial Sugar.